For a year now, the UK Government has rejected calls for airdrops saying they are too dangerous and too difficult. Safe options for airdrops are being ignored by Government ministers. Technology for precision airdrops that would allow aircrews to safely drop guided parachutes from beyond Syrian airspace is already being used by UK allies in Syria—but these GPS guided parachutes are being used to drop arms, not aid. A year has gone by since Jo Cox in the House of Commons first voiced the call for humanitarian airdrops to besieged Syrian communities. Back then it was images of clearly starving children in the town of Madaya that stirred MPs to speak out. In the year since, the UK Government has been presented with a range of options for airdropping aid to Syrians under siege at little or no risk to British aircrews. One option presented to the UK Government in the last year has been a detailed costed proposal for airdrops using existing drone technology. Another has been airdrops using precision JPADS technology which would allow some besieged areas to be reached by remotely guided parachutes dropped from outside Syrian airspace. This week, USA Today reports on how these GPS guided parachutes are already being used by the Coalition against ISIS to drop arms to local allies inside Syria. Gen. Carlton Everhart told USA Today of the US Air Force’s ‘expanded precision airdrop capability.’ The Air Force conducted 16 airdrop missions in Syria last year, including six in December. The airdrop missions have changed dramatically since previous wars, such as Vietnam, when pallets would be easily blown off target, sometimes landing within reach of the enemy. Today, the bundles are guided onto landing zones using GPS technology and steerable parachutes. ‘We'll get it within 10 or 15 meters of the mark,’ Everhart said. The supplies range from small arms ammunition to vehicles. The Air Force can drop supplies at night and vary where they are dropped to ensure militants are not able to seize US equipment. 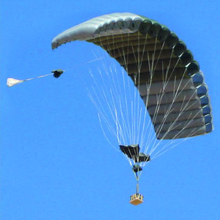 A leading manufacturer of JPADS technology describes how their system allows parachutes to be dropped from a standoff distance 25 kilometres away from the target and then remotely guided to the impact point using GPS navigation. This ability to drop from a distance means besieged areas like Madaya—one year later still under siege by Hezbollah and Assad forces—could be reached by airdrops without aircraft ever having to enter Syrian airspace. 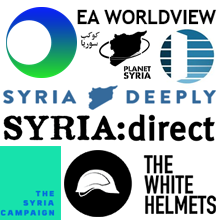 Over 140,000 people recently signed a petition calling on the UK to drop aid to besieged Syrian communities. The Government rejected the call and the Petitions Committee rejected a debate. In a December 2016 letter on airdrops, Prime Minister Theresa May rejected them primarily on the grounds that aircraft would be risking attack by Russia. In words repeated in the Government’s rejection of the public petition, she then asserted that the same risk applied to unmanned options. Clearly this is nonsense. No aircrew lives are at risk if unmanned drones are used for airdrops, and if planes drop GPS guided parachutes from outside Syrian airspace, there can be no legitimate grounds for Russia to attack. The UK Government set out two aims for its Syria strategy when MPs voted for action in December 2015: To defeat terrorism in Syria, and to end the refugee crisis. Today the Government is sitting on its hands while a proscribed terrorist organisation, Hezbollah, besieges Syrian civilians with the aim of driving entire communities from their homes. Continued UK inaction on relief to besieged communities will further empower and entrench terrorism, and further worsen the refugee crisis. End the excuses. 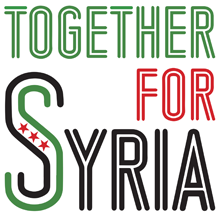 Drop aid to besieged Syrian communities now. US increasing airdrops of supplies to forces battling ISIL in Syria, USA Today, 17 January 2017. Can JPADS save lives in Syria? APPG Friends of Syria, 13 January 2017. Air-drop life saving aid into the starving cities in Syria, petition to the UK Government. Photo: FireFly guided precision aerial delivery system by Airborne Systems.